Born in Brussels on 16th November 1908, Madeleine Cinquin was the daughter of a bourgeois family who were lingerie manufacturers. Her mother was Christian and her father Jewish. When she was six, she saw her father drowning and in her life memoir she will confess that this tragic event is at the origin of her religious commitment and her willingness of absolute. However as a young girl Madeleine used to dance and flirt in 1920s Paris, beautiful and coquettish she was seeking for immediate pleasure. 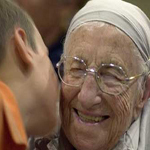 But she wrote that she always felt her vocation calling her and in 1929 she took her religious vows. She wanted to help poor people. Initially, however, she worked in Istanbul, educating rich diplomats' daughters. 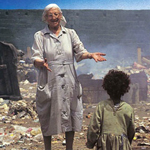 In the 1970s and 1980s, when she could have "retired" she devoted heself to helping poor children in the slums in Cairo and living in the same conditions. She was then in her 60s and she continued her amazing work well into her 80s. She focused with her association " Les Amis de Soeur Emmanuelle" ( Sister Emmanuelle's friends) on the health and education of children . She worked on opening dialogues with Muslim people. She lived without making any prozelytism. On her door in Cairo, a Christian cross and a Croissant were hang together with these words: " God is Love". 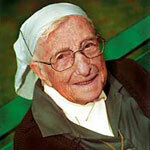 With a passion for philosophy and religion, she was a sincere humanist who had a true faith in human beings. 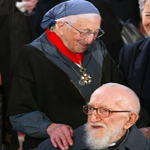 French people loved Soeur Emmanuelle because she had this incredible freedom of speech and an unusual frankness. She confessed her religious doubts, her personal fights when she fell in love, when she was sick and couldn't help poor people, her own weaknesses... She became mediatic and exerted a general fascination. Her tantrums towards bourgeoisie, political skulduggeries were frequent. Nicknamed "Naughty Nun" by the French newspaper Libération or "French Mum Theresa", Soeur Emmanuelle was never afraid to voice her unorthodox views about the Christian religion. For instance she was in favour of priest marriage and considered taking the pill as necessecary for women in the slums of Cairo. 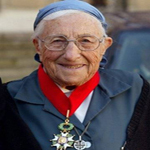 In 2002, she was awarded the Légion d'honneur by Jacques Chirac, Sister Emmanuelle is an example of bravery, open-mindness, energy and faith not only in God but in human beings. Close to the Abbé Pierre, their two deaths plunge France into mourning. Hommage is paid all over France. Bernard Kouchner foreign minister and co founder of Medecins du Monde remembers the hope and joy she gave him and everyone who came in contact with her. She died serene maybe only with the regret of not having died amongst the people she helped in Cairo.